Life sciences and allied sectors are gaining more importance in India than ever before, be it industry, biomedical and basic research or the understanding of our spectacular biodiversity. We envision India as a nucleus for research in frontier areas in the near future; but for this to happen it is imperative to foster a world-class community of scientists, administrators and policy makers. 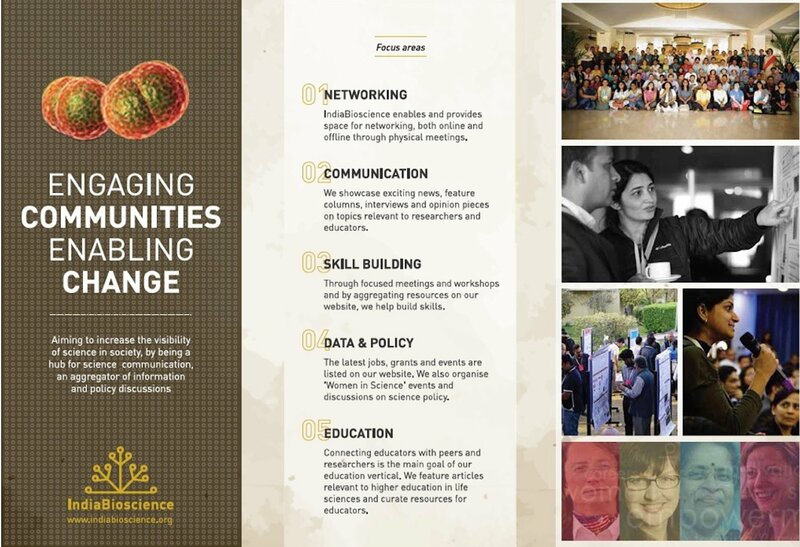 IndiaBioscience is an organization that fills a unique niche in the ecosystem of the life sciences in India, by being a catalyst to promote changes that affect the culture and practice of the field, through engagement with academia, government and industry at various levels. IndiaBioscience aims to increase the visibility of science in society, by being a hub for policy discussions, science communication, and as an aggregator of information. IndiaBioscience has been nurtured within the campus of the National Centre for Biological Sciences, Bangalore, but our mandate is broad-based in serving the life science profession across India. Some of our activities over the past few years have been establishing a mentorship and recruitment program for exceptional faculty through Young Investigators’ Meetings, provision of career resources for students and young professionals and facilitation of research collaborations through specific programs. We have also begun preliminary efforts towards addressing undergraduate science education in India. IndiaBioscience is majorly funded by Department of Biotechnology (DBT), Government of India.